Danny Boyle had never been to India before shooting "Slumdog Millionaire"
Boyle on shooting in Mumbai: "It's pretty mad. Everything is extreme." LONDON, England (CNN) -- It was the stench. That was what really hit Danny Boyle the first time he went into a slum in India. In "Slumdog" a poor man wins a place on India's version of "Who wants to be a Millionaire?" "There's this smell you get first of all," recalls the British director. "This incredible mixture of our excrement -- it belongs to all of us -- and then saffron. It's just this mixture of sweet and sour." Boyle's experiences shooting in the teeming, chaotic port city of Mumbai could also be described as sweet and sour. The director, who is renown for films like "Trainspotting" and "28 Days Later," had never even been to India before he and his crew traveled there to make the critically acclaimed Oscar contender "Slumdog Millionaire." "It's pretty mad," admits Boyle. "Everything is extreme. It's too hot, the tea is too sweet; everything is kind of too much." But, he adds: "That's wonderful for drama, absolutely wonderful." He and his crew threw themselves into shooting their drama in the streets and landmarks of India's "city of dreams" using passers-by as extras. They also shot in the Dharavi -- Asia's largest slum -- and Juhu slum which can be seen from the city's airport. "Slumdog" is a classic rags-to-riches story about a young boy from the slums, Jamal Malik (played by British actor Dev Patel), who beats millions of other Indians to bag a coveted place on the country's version of TV game show "Who Wants to be a Millionaire?" Through the timely story of the young "slumdog," Boyle illuminates the contradictions of present day India -- the nuclear power that does not provide public sanitation for its population -- and Mumbai was the ideal city in which to do it. "Mumbai is a city of extremes," Boyle explains, "Life is raw. It's incredibly powerful and rich because their economy is expanding, the richest men in the world are there ... but then there is also this enormous poverty as well." 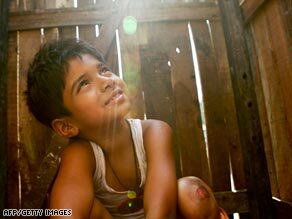 Do you think Danny Boyle has captured India in "Slumdog Millionaire"? Tell us below in the SoundOff box. Boyle's film shows these extremes with great realism. He takes the audience from the cheerfully money-grubbing micro-commerce of the slums where young boys charge slum dwellers to use filthy latrines, to Jamal's job as a "chaiwallah" (tea boy) in one of India's much-publicized call centers, and later, to the Indian game show phenomenon, "Kaun Banega Crorepati." Boyle achieved this realism by immersing himself, his crew and actors in the Mumbai sprawl, and shooting as much as possible in real locations. "I wanted to feel really involved in the city. I didn't want to be looking at it, examining it. I wanted to be thrown into the chaos as much as possible. "There's a period of time between about 2 a.m. and 4 a.m. where it all stops and just the dogs move around, but other than that, the place is just a tide of humanity." With limited time in India, Boyle made the decision to travel to the places he intended to shoot and film the cast's rehearsals there. This was something the film's star, Patel, found challenging at first. "It's daunting at first doing these scenes outdoors with loads of people watching, but they just warm to it and everybody is, like, laughing and they start clapping at the end of the scenes," Patel laughs. His co-star Frieda Pinto, who plays love interest Latika, was born and brought up in Mumbai and knows the city well. Watch Dev Patel and Frieda Pinto talking about the making of "Slumdog Millionaire." "You can't stop the bystanders in Bombay," she explains, "It is something that you attract anyway, especially if you have a camera out there and a foreign crew and a song and dance. "You are definitely going to attract a huge crowd and you can't do anything about it. The only thing you can do is enjoy it." For Boyle and the crew, on the other side of the camera, the energy and chaos was a pretty intense experience. "You just don't have any control in India," he explains. "If you seek it, it will drive you insane. You've got to go with it really and just see what happens." But they did have some tricks up their collective sleeve. Boyle and veteran cinematographer Anthony Dod Mantle shot crowd scenes, like the chase through Juhu slum at the beginning of the film, using the people who happened to be passing by on the street for added realism. They wanted to draw as little attention to themselves as possible to keep the crowds looking natural. To achieve this feeling of being right in the middle of everything without disturbing the local communities too much, they used a variety of small digital cameras and digital stills camera. "[We used] a Canon stills camera, which takes 12 frames per second. If people see a stills camera, they don't think it's recording live action," he explains. For Boyle, who believes his first film, "Shallow Grave" (1995) is still his best, because "you haven't a clue what you are doing" and "you haven't learnt the tricks yet," he says, shooting in Mumbai was a way of recapturing that early originality. "You arrive and you feel a bit vulnerable and naked again, and that's a really good thing, because you are not tempted to just step in your own footsteps all the time."